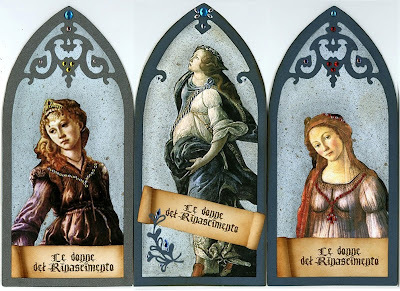 Next we have my Gothic Arches for the Renaissance Women Swap I hosted on Paper Traders. 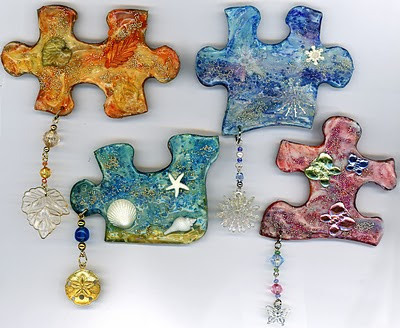 It was a six for six swap but Beckie, Letha and I often try to do one for each other as well when we all participate and swap amongst ourselves too so I made extras for them and myself as well. I used my new Silhouette Digital Cutter Machine to cut the arch overlay (which I designed myself!) . That worked great and so much nicer than trying to cut them with an X-acto knife! The arches were cut from heavy watercolor paper, then layered with a textured paper on which I used charcoal to create the shadowing effect (which does not show up very well in the scans but looks great in real life). 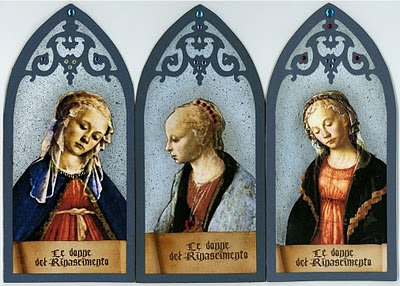 The images are all from artwork by Italian Renaissance painter Sandro Botticelli which I cut by hand and layered on the arches. Then I layered on the scroll labels and arch overlays. Finally I added crystal jewels to them to give sparkle and shine. (Thanks Laurie for the blue jewels!) 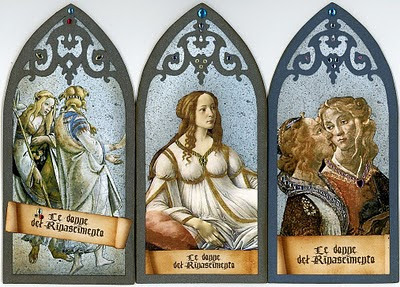 I didn't scan the backs but they too are finished with a picture of Botticelli and a brief story about him and his art, done in the same style as the fronts. 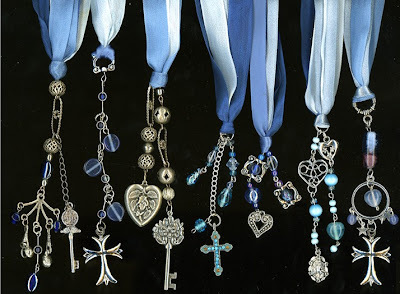 These are the charms that I made to go with my pages. I actually made two more but forgot to scan them before giving them away. They were fun to do.